KozaK Needs no water- it’s a Dry Wash”. KozaK Dry Wash Cloths have a double-sided, deep, plush napped finish. Kozak makes their amazing Dry Wash Cloths in two sizes: Regular 3.8 sq. ft. and Super Size 4.5 sq. ft. The regular size is great for cleaning cars and compact trucks! KozaK Dry Wash Cloths have been a staple in the auto care industry since 1926. Business was brisk at the R.M. Walker Ford Dealership, in Batavia New York. Back in those days two men had to work all night with a bucket and hose to prepare cars for demonstrations for the following day. Even though business was good, the times were lean...and hiring two men to work all night was an expense. KozaK Dry Wash Cloths were invented out of simple necessity – to cut out the expense of the car wash. And they worked too. The Dry Wash Cloths saved 80% of the wet-washing expense; both in time and materials, and it was discovered that the cloths were extremely durable. Further enhancing their cost-effectiveness. Each cloth could easily withstand up to 50 cleanings. The news of KozaK’s amazing Dry Wash Cloths took the nation by storm. Soon the cloths were carried in over 10,000 Rexall-Liggett drug stores, Firestone Stores, Ford Tractor and Implement dealers, and gas and oil companies also took to selling the cloths. The buzz was incredible; folks simply couldn’t believe that a completely dry cloth could effectively wash a car – without doing any damage to the paint! Today, the same statement holds true. KozaK “Needs no water- it’s a Dry Wash”. And a showstopper. The original cloth has changed very little throughout the years. KozaK Dry Wash Cloths are specially constructed and chemically treated. The fabric is 100% cotton of the finest domestic blend – still one of the world’s softest materials. And only KozaK Dry Wash Cloths have a double-sided, deep, plush napped finish. The exclusive KozaK formula is then infused within the fabric, which makes the cloth clean like a vacuum – pulling dust, dirt, and contaminants up and away from the automotive surface, and seizing it within the weave. The Dry Wash Cloths polish the surface as they clean, and the car looks like you’ve just spent hours washing and waxing! The Kozak Dry Wash Cloth is a silicone-free, wax-free, nonabrasive cleaning cloth. It’s simple to use KozaK Dry Wash Cloths. First, make sure the vehicle is completely dry, to get the best results from the exclusive Dry Wash features. Keeping the Dry Wash Cloths folded like a thick pad (do not open up like a towel!) wipe lightly, in straight sweeps at first to remove the top layer of dust and dirt. Then refold and repeat... always making sure to knock the pad against your other hand to release the loose, heavier dirt from the napped fibers. To polish car, use clean surface of the cloth and apply heavier pressure. Thus the cleaning and polishing in one cloth – without ever wetting the car! 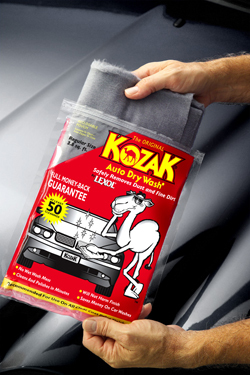 The Kozak Dry Wash Cloth is safe on clear coats and single stage finishes! KozaK Dry Wash Cloths are completely non-abrasive and the process is safe to use on all finishes – even clear coats. And the KozaK formula is safe as well – it won’t harm the environment or your skin! 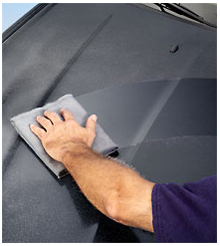 Use KozaK Dry Wash Cloths on every area of your car except for windows and windshields. The treatment in the cloth is not compatible with washer fluid, so if used on the windshield – streaks can develop. Everywhere else – go for it – the only thing you’ll see is your own reflection smiling back at you as you admire the deep shine you’ll achieve with KozaK! Conserve water, and materials – use KozaK Dry Wash Cloths between ‘wet washing’ to keep your car looking newly detailed every day! The usefulness of some things diminish with time – but KozaK Dry Wash Cloths just get more popular with age. For nearly 80 years KozaK has been keeping cars looking pampered and new – it’s tried, tested, and true – see what it can do for your car! Regular Size- 3.8 sq. ft.
KozaK® Auto Dry Wash 3.8 sq. ft.
KozaK® Auto Dry Wash 4.5 sq. ft. I had a Kozak Auto DryWash many years ago (45 years ago!) and loved it. I now have a sports car again and want to keep it looking great, so am getting a new one. Kozak is a good item to have in your car or nearby to keep it looking good. It's good for overall cleaning or minor touch-ups. The finish will stay cleaner longer and be easier to wet wash when that's needed. I have three. When the newest gets dusty it becomes number two. More age and use and it becomes number three. I use the Kozak for the car and the plane and get compliments on how each looks. Buy a pair of cotton gloves. They keep your hands clean and have a better grip on the cloth. They are truly fantastic. They keep your car looking new and save a great deal of money not having to go to car washes. Very professional people I dealt with and product arrived in great shape. Ive bought this cloth before and was very satisfied. It does, what it says it will do, namely keep your car shining without water.